It’s heartbreaking to watch your child go through cancer treatment but we’re fortunate because Lucy’s brain tumour is treatable. 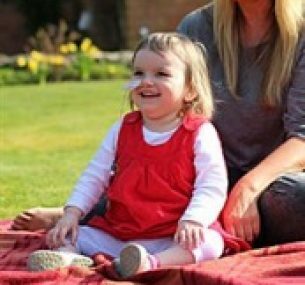 Lucy was seven months old when she was diagnosed on 16 February 2012. She has pituitary blastoma, which is an embryonal tumour. Lucy became really sick one Saturday afternoon and got worse over the weekend. She kept on being sick but didn’t have a temperature so we took her to the doctors. They thought it was just a virus but we were referred to the local hospital for rehydration treatment because she was still being so sick. Later that night that the doctors said they would need to look at her head to find out what was wrong. 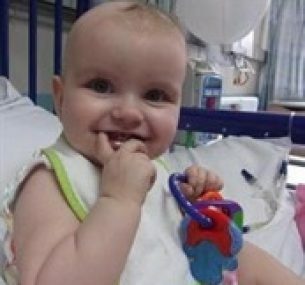 She spent seven months in Birmingham Childrens’ Hospital – most of the tumour was removed in February but she needed a second surgery in August. Some of the tumour is still there and growing but because of the position, the surgeons can’t get to it. Lucy fights her little heart out every day, nearly always with a smile and a wave. Her resilience and spirit are inspirational. Thankfully, so far, she’s doing really well. Her treatment is in an observation stage at the moment – she needs regular check ups including MRI scans, eyesight tests, neurology appointments and blood tests. Our epic stays with Lucy in hospital were really hard on Ben, her big brother, so it was great to all attend Children with Cancer UK’s Zippo’s Circus event in September 2013. We didn’t tell the children where we were going because quite often plans have to be cancelled at the last minute if Lucy gets really sick. We all had a fantastic day and although it was quite a jaunt down to London, it was all part of the fun for Lucy and Ben! We have been doing various little bits and pieces to generate some fundraising for Children with Cancer UK. I ran a chocolate tombola, sold refreshments at Ben’s school panto and the school helped me to run a little raffle. We have made £309 which is going towards my cousin Anjie’s fundraising – she’s taking part in lots of runs including the Virgin Money London Marathon. I am pleased to report that we have had a good year. Lucy has not had to endure any surgery or chemotherapy. Lucy is now at a nursery school and goes for 2.5hrs a day, five days a week. She is still unable to walk unaided but, with support, is becoming increasingly more confident. Her speech is coming on really well and she can count to ten and has started to be able to identify some colours. Lucy still relies on an NG tube for fluids but she is currently eating well. We are having MRI scans every three months, under general anaesthetic. The last one in October showed ‘no significant change’ to the previous one. She has another booked for Jan 2015. We are looking forward (hopefully) to a happy and healthy(ish) Christmas! Although Lucy hasn’t had any active treatments for a while we have never had a conversation with the doctors where the word remission has been used. She undergoes regular monitoring. Also her lifelong health problems haven’t been caused by the intensive treatment she’s received, but more from the location and nature of the tumour itself. 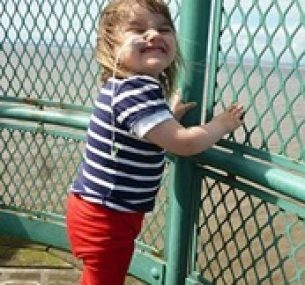 Lucy was diagnosed with pituitary blastoma, a type of brain tumour when she was seven months old. Her mum Sarah tells her story.